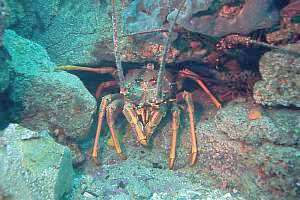 f006102: a large crayfish tagged with an acoustic pinger, for the purpose of discovering how crayfish migrate from day to day and seasonally. 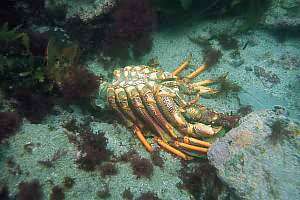 When this cray moults, it also loses its tag. [A6] f015728: closeup of the mandibles of a crayfish. f010725: quite against intuition, females choose the bucks of their liking. Here they can be seen holding on to their dream boys, which are much larger. 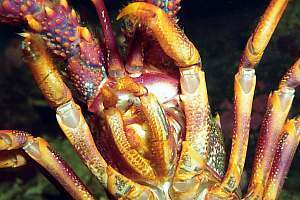 It may well be advantageous to crayfish populations if fishermen let the large ones escape. 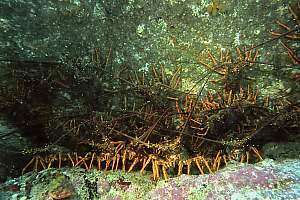 f214312: A spanish lobster was caught in the act of moulting. Here the animal is seen leaving its old shell. 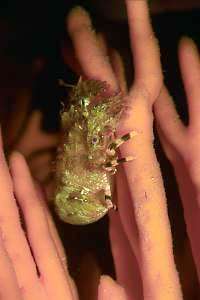 First it draws itself out of the chest part, leaving the old skin around its feelers, eyes and even gills in tact. Then it shakes its tail part off in a single flick, which it is just doing now. 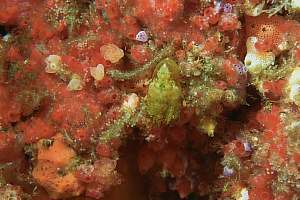 Prior to moulting, the animal refuses food for two weeks, and a whole week after the event likewise, because its skin (and mouth parts) is still too weak for chewing. 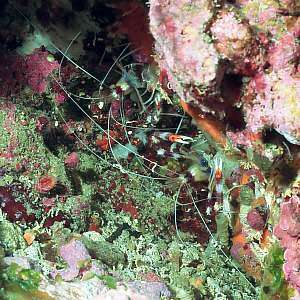 f020219: the banded coral shrimp is an endearing creature. 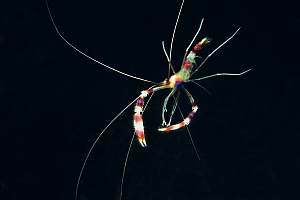 With its six long antennas and gaudy colours, it announces its presence to passing fish. 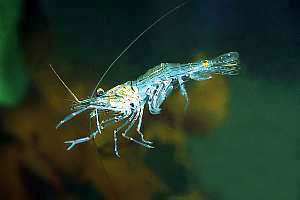 In the tropics these shrimps jump onto a visiting fish in order to cleanse it from parasites. However, in New Zealand they are less occupied in this kind of trade. 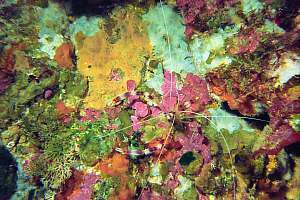 f030422: banded coral shrimps are often found in pairs, and they can be found inside the same crevice for many years. Here are two of them, a spaghetti junction of white antennas. 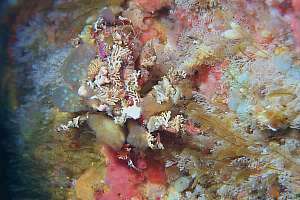 f020222: With its swimmerettes underneath its abdomen, a coral shrimp swims stately and purposefully through the water. This photo shows its weird anatomy. 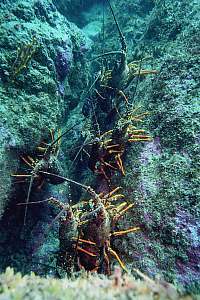 The five pairs of legs, counting from the rear, are: leg, leg, claw, nipper, nipper. 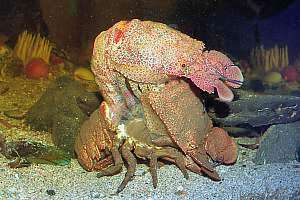 This is quite unusual for crustaceans. f013929: the common shrimp in New Zealand (Palaemon affinis) is a keen swimmer, being able to swim both forward and backward with ease. Its four long antennas give it early warning of impending danger. 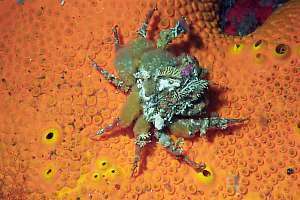 With its little nippers it cleans many organisms in exchange for food. 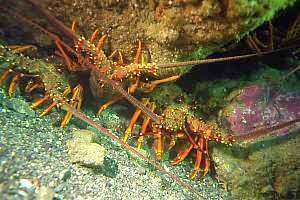 Many more photos of crustaceans available.